Neither of them are turkeys, by way of a hint. Not to be smug about it, but SEANET has been doing citizen science since before citizen science was cool. Or at least, since before it was widely accepted as a viable and valid method of collecting large scale data sets. For a long time, the critique from the science establishment was that lay people without formal science training could not match the quality of data generated by trained scientists. Over time, more and more citizen science projects have taken off and produced high quality data sets on a scale impossible for scientists and their exhausted grad student minions to replicate. Now, in the face of these data, many former naysayers have had to admit that citizen science plays a role nothing else can. Professional scientists needn’t have feared; the rise of citizen science can, in many cases, free them up to do things besides constantly collecting data themselves. Study design, data analysis, publication of results, all these things remain in their purview. 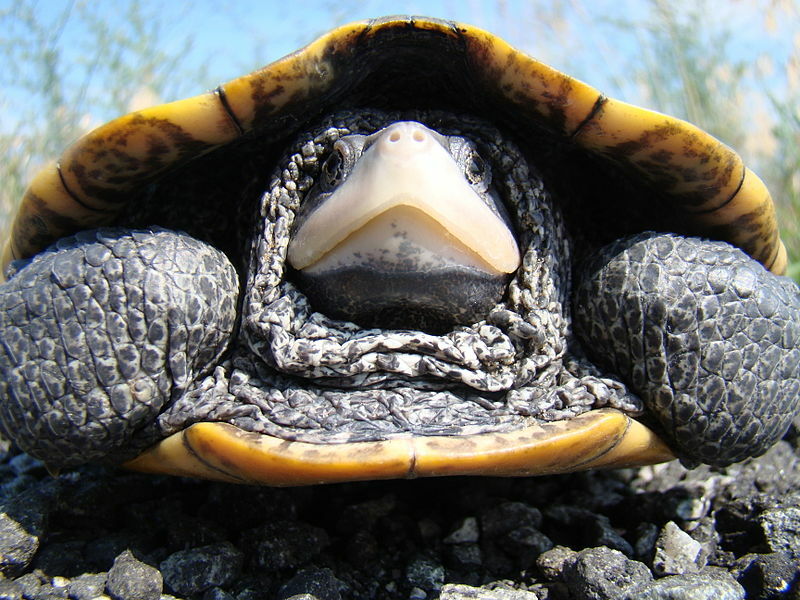 As these views have evolved, it has remained critical to ensure that citizen scientists, who often collect data with little to no direct supervision, are actually doing a good job. In some projects, that requires intensive training before joining up–learning how to identify organisms, or take measurements with accuracy and precision, for example. These trainings were often in person and labor intensive, and sometimes also cost prohibitive, so many programs began looking for alternative methods of training, whether with print materials or mult-media ones. The slick and flashy app interface of the Outsmart cit sci project. 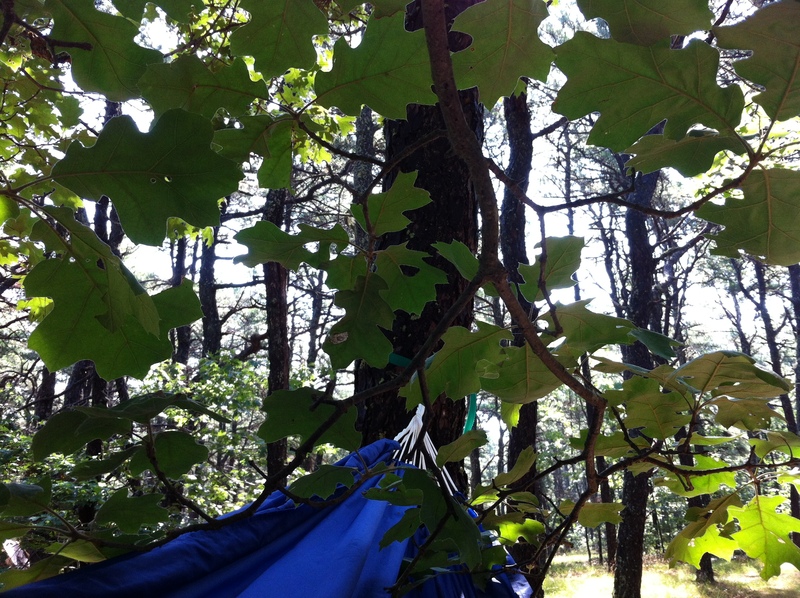 A new study out in PLOS one looked into the relative effectveness of print vs. video training for volunteers monitoring invasive plant species in Massachusetts. They determined that video training out performs plain print resources (photos and text descriptions of plants), but, perhaps more importantly, rivals in person training in preparing volunteers who can correctly identify invasive species. Moreover, when volunteers did incorrectly identify species, they tended to be plants that were challenging for all volunteers, regardless of how they were trained. Identifying exotic honeysuckles, for instance, is hard for almost everyone, while multiflora rose was identified by nearly 100% of volunteers. For SEANET, we have chosen to put more work in on the back end of data collection. Our volunteers are not required to have any knowledge of species identification when they join (though they tend to acquire it if they stick around); instead, every bird must be photographed so that it can be reviewed for accuracy as to species. For a program of SEANET’s relatively modest size, this works well, and I am able to review everyone’s reports individually. But on a scaled up project–something like ebird for instance–the program leaders must rely on the volunteer’s abilities and experience, and only reports that seem strange or outlandish are challenged and followed up on. If SEANET were to get so big as that, we’d have to modify things. 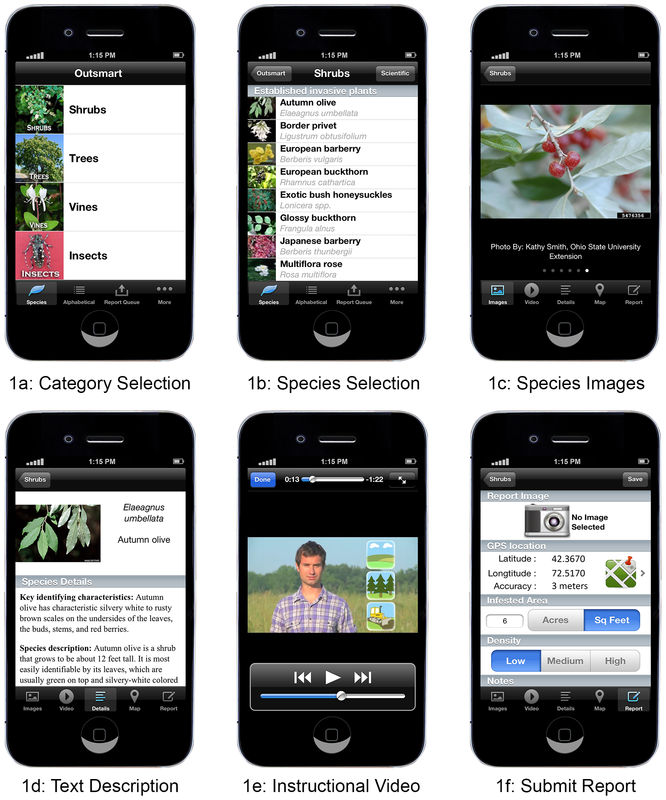 One thing the invasive plant project studied in this article has that I do indeed covet is a very slick and attractive interface in a smartphone app. We’ve talked about having such a thing for SEANET for a long time, but as of now, it’s not in the cards. But you can all gaze in wondering admiration at this plant project’s interface, and, if you are located in the northeast, you might even consider participating. If, of course, it wouldn’t cut into your Seanetting. The title here may be somewhat hyperbolic, but the situation on Gil Grant’s North Carolina beach on November 10 was striking. Gil found 7 dead birds, all of which had been thoroughly dismembered and stripped of flesh. For the most part, all that remained were wings and the occasional flayed skull. Six of the birds were laughing gulls, and one was a ring-billed gull. Nice clean skull, possibly thanks to ghost crabs. 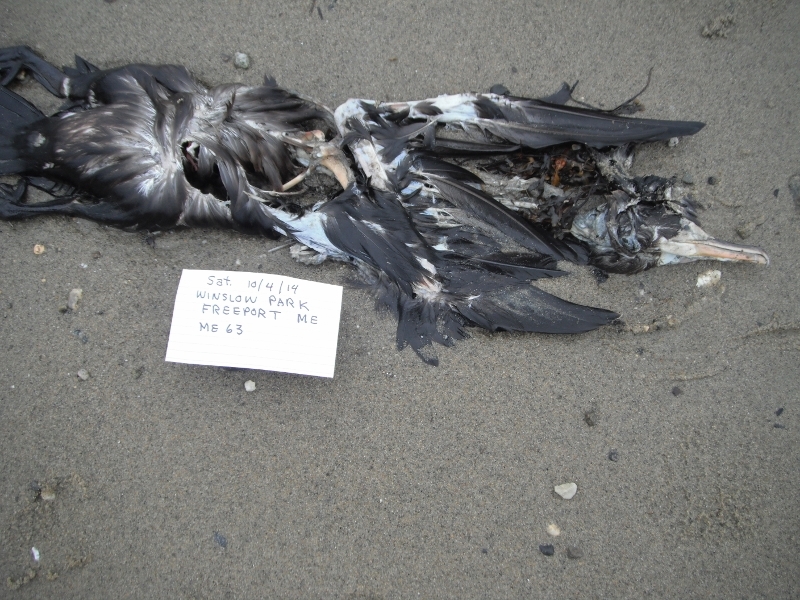 This is a situation we encounter a few times a year: a suspected case of bycatch, where birds are entangled and killed in fishing gear and then tossed aside. The diagnosis is not easy to make, however, even in fresh carcasses. 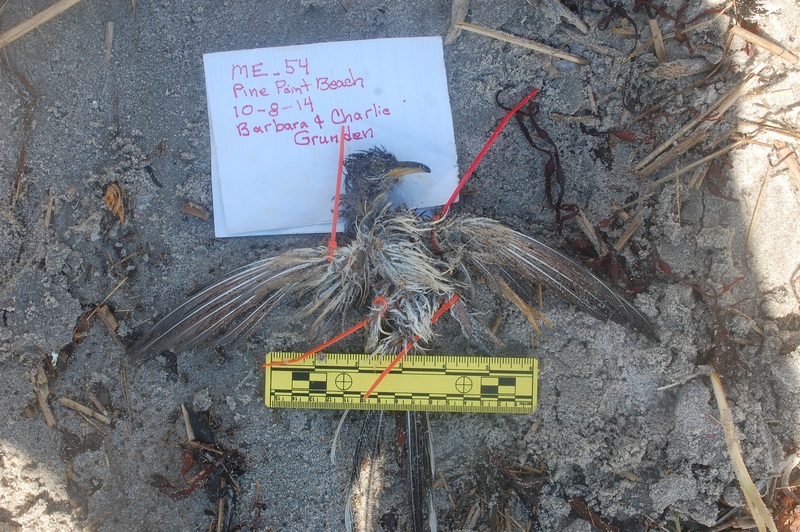 When a bird is documented coming up dead in a net or other gear, the case is fairly clear. 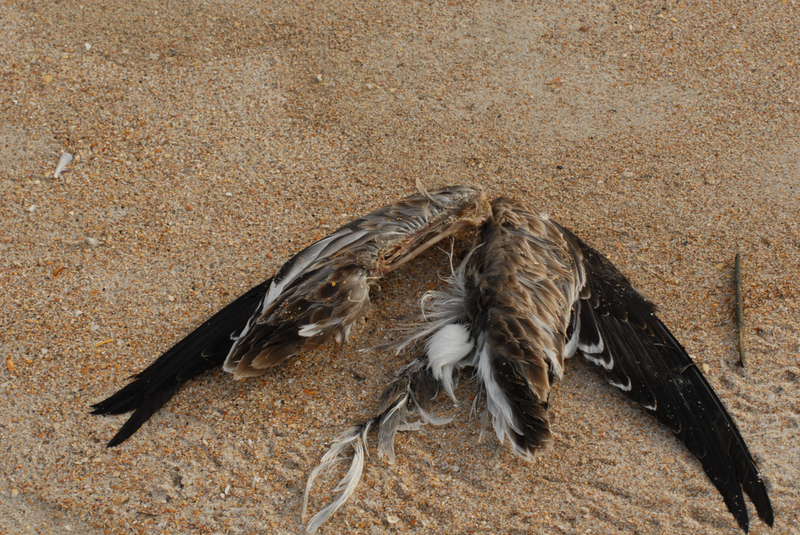 But we often get only a waterlogged carcass washing up on a beach, and it’s much harder to attribute those deaths to bycatch. 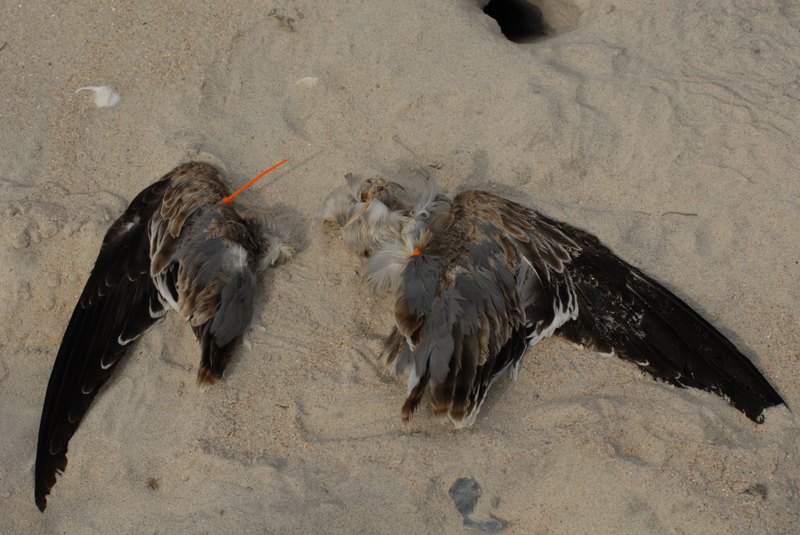 The situation on Gil’s beach is further complicated by the heavy scavenging of these carcasses. 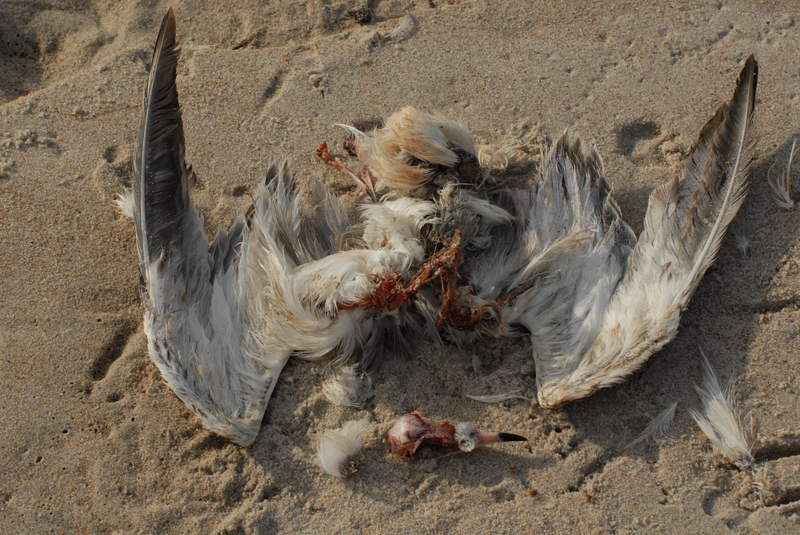 This scenario is common–larger scavengers like other gulls pick the carcasses apart, and then, on southern beaches, it appears that ghost crabs do a thorough job of cleaning almost all the remaining flesh off the bones with remarkable speed. You can see a crab burrow near a carcass in one of these photos. We don’t see quite this much cleaning off of bones up here in the north, which, to me, is further support of my ghost crab hypothesis, since we don’t have them up here. Because of the scavenging, there is no way to determine a definitive cause of death in these birds. But we have at least documented the presence of these several carcasses. I have been chatting with researchers interested in tracking bycatch and marine debris, and they are also interested in these more circumstantial cases, so we may soon be contributing photos from cases like Gil’s to that effort as well. You never know to what use your SEANET reports may be put in the name of conservation science! The field guides are finished! 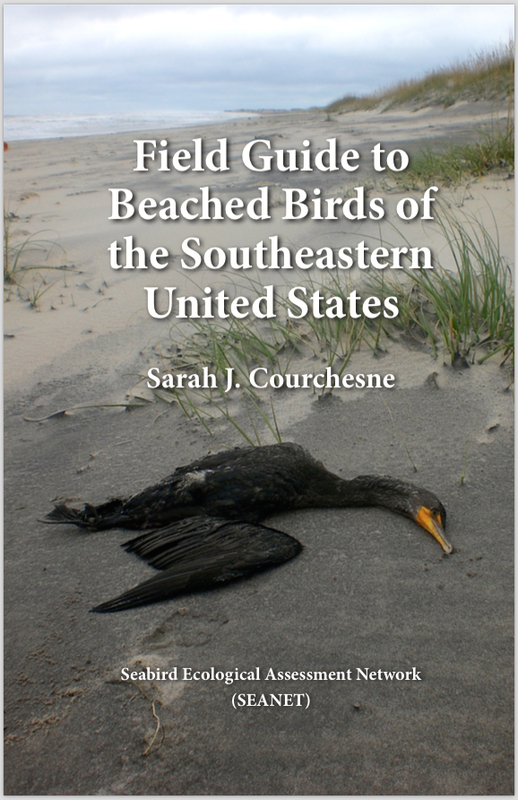 It is with no small degree of personal pride that I officially announce the completion of the Field Guide to Beached Birds of the Southeastern United States by me, Sarah Courchesne. Of our initial print run of 720 books, 500 will go directly to our funder, the US Fish and Wildlife Service, for distribution to biologists and other folks both in that agency and with National Parks, or NOAA, or USDA or what have you. John Stanton will be deciding which lucky guys and gals get those. The remainder will be for us here at SEANET to decide. What I would like to offer is first dibs to any Seanetter who has put in at least a year of beach walks. You need not live in the southeast, but should I get inundated by requests, precedence will go to the southern contingent. For those who qualify, I will ask only that you pay for the shipping. Please contact me if you are one such SEANET veteran interested in a guide, and I will give you specifics on how to order it. Once I have distributed those, I will offer up the remaining books as thank you gifts to anyone who makes a $30 or more donation to SEANET. Could there be a better Christmas gift, I ask you? I think not. Thanks to everyone for their tolerance and forbearance over the course of this multi-year project, and I hope you all enjoy the finished product. Many, if not most, of the photos in the guide were submitted by you folks, so don’t be surprised to open up the book and see your own name, whether you actually walk in the southeast or not! Let us continue the Wellfleet theme just a bit longer, shall we? SEANET ally Jenette Kerr sent along word of a great way to spend this Saturday should you find yourself on Cape Cod. Pertinent points to consider: the conference is free and open to the public AND includes a complimentary continental breakfast! 8:30 AM–2 PM at the Wellfleet Elementary School. The conference is free and open to the public. This year’s event features research and other activities related to the planned restoration of tidal flow to the Herring River as well as surveys aimed at learning more about animals that make a living in and near Wellfleet Harbor—oysters, river herring, horseshoe crabs, diamondback terrapins, and ocean sunfish. Among this year’s presenters will be Nauset High School students who’ve teamed up with fifth graders from Wellfleet and Truro to compare oyster growth and mortality in various locations of the Herring River and Mayo Creek. The conference also will feature a field trip on Sunday from 9:30–11:30 AM, a tour of upper Herring River culverts and road crossings led by some of the scientists and conservationists involved in the river’s planned restoration. Details about the conference and field trip can be found at http://www.massaudubon.org/wellfleet-harbor-conference. Sponsors of this year’s State of Wellfleet Harbor Conference include Cape Cod Five Cents Savings Bank, Mid Cape Home Centers, the town of Wellfleet, the Wellfleet Conservation Trust, Friends of the Herring River and Mass Audubon. Food donations are being made by Mac’s Seafood, the Wellfleet Box Lunch, Dunkin Donuts, the South Wellfleet General Store, and PB Boulangerie.